Purchasing a phone these days is an investment. 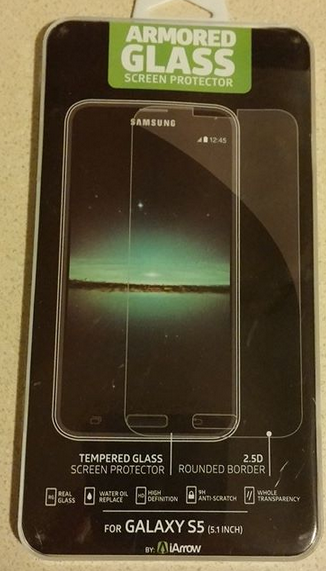 Why not protect it with a screen protector? The Samsung Galaxy S5 is one of the hottest phones out right now. It’s no wonder why either. The large screen and many features it bosts are very appealing. This phone though, doesn’t come with a screen protector. Anyone who has had a smart phone, knows how easy it is to scratch the screen, crack it, and much much more. It leaves the user frustrated trying to protect this precious treasure. Sure it can be replaced, but for a deductible with most cell phone companies. That’s when the tempered glass screen protector comes into play. This screen protector is very easy to apply. If you are like most people, you have tried to apply a screen protector on your own at some point and were left with the headache of trying to get the air bubbles out from under the protector. This protector isn’t like all of the others. It goes on and no air bubbles. I was surprised myself. The protector is tempered glass and 99.9 percent visibility as well as accuracy for touchscreens. This really does feel like I am touching the screen alone itself, but I’m not. I really love the company’s promise with this though. If you aren’t satisfied with this product, you simply return the product within 90 days and they will not only refund the purchase, but send you another screen protector. That’s a wonderful business practice.